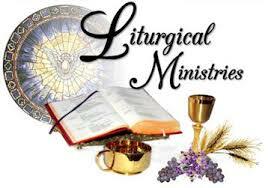 Mission Statement: The purpose of the Parish Liturgy Committee is to promote quality worship in the parish under the guidance of the pastor (Diocese of Wilmington – Guidelines for Parish Liturgy Committees). Since liturgy is essential for the expression and celebration of our faith, we need to embrace, nurture and educate the assembly where it is needed. This formation will bring the parish to a fuller understanding of the mysteries of God and to the growth of a more active participation of the people. Contact Kathy at (302) 653 – 8976 for more information. Please consider serving in this important ministry. DEFINITION – ABLUTION: Liturgical washing.. The Lay Ablution is an explanation as to why the Purell Dispensers were taken out of the Church. The EM’s no longer wash their hands before giving out Communion. Only the priest is allowed to wash his hands during the liturgy. According the General Instruction of the Roman Missal, the only ablution is to be done by the priest. After communion the priest returns to the altar and collects any remaining particles. Then, standing at the side of the altar or at a side table, he purifies the paten or ciborium over the chalice, then purifies the chalice, saying inaudibly: Lord, may I receive these gifts, etc., and dries it with a purificator. If this is done at the altar, the vessels are taken to a side table by a minister. It is also permitted especially if there are several vessels to be purified, to leave them, properly covered and on a corporal, either at the altar or at a side table and to purify them after Mass when the people have left (# 120 – General Instruction of the Roman Missal). Purifications: Whenever a particle of the Eucharistic bread adheres to his fingers, especially after the breaking of bread or the communion of the people, the priest cleanses his fingers over the paten or, if necessary, washes them. He also gathers any particles that may fall outside of the paten (#237 – General Instruction of the Roman Missal). The vessels are purified by the priest or else by the deacon or acolyte after the communion or after Mass, if possible at a side table. Wine and water alone are used for the purification of the chalice, then drunk by the one who purifies it. The paten is usually to be wiped with the purificator (# 238-General Instruction of the Roman Missal). If the Eucharistic bread or any particle of it should fall, it is to be picked up reverently. If any of the precious blood spills, the area should be washed and the water poured into the sacrarium (# 239 – General Instruction of the Roman Missal). These four articles are the only mention of ablutions in the Liturgy Documents. This is not that liturgy makes no demand upon architecture, music and the other arts. To be true to itself and to protect its own integrity liturgy must make demands. Basically, its demands are two: quality and appropriateness. Whatever the style or type, no art has a right to a place in liturgical celebration if it is not of high quality and if it is not appropriate (# 19 – Environment and Art). Appropriateness – it must clearly serve (and not interrupt) ritual action which has its own structure, rhythm and movement (# 21 – Environment and Art). The second point (to serve) refers both to the physical environment of public worship and to any art forms which might be employed as part of the liturgical action (e.g., ritual movement, gestures, audio-visuals, etc.) (#23 – Environment and Art). Purell dispensers are not appropriate objects for the worship space, nor is the gesture of the Eucharistic Ministers’ washing their hands a part of the liturgical ritual. Therefore, the Purell dispensers have been removed from the worship space. In conclusion, the only ablution during a liturgical celebration is done by the priest, or if needed by a deacon or acolyte.